Hello and happy Tuesday. It's time for another challenge at CASology. 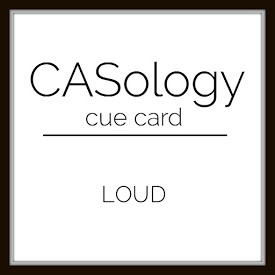 This week, our cue word is loud. I pulled out my cute little mice from Strike up the Band, and let those cuties make some noise. Now it's your turn. How does LOUD inspire you? I hope you play along this week. Please remember to keep it Clean and Simple. Our Guest Designer is Cornelia. There's nothing like a few MFT marching band mice to add some noise to the room :) Love your bold color palette and how you placed them inside the CAS Polaroid...Love this card, Joyce! Totally adorable - those mice almost made it onto my card, but then I changed my mind.... Thanks for having me as your GDT! Too darn cute...so in love with your sweet musician mice and love your fabulous coloring. Great images for a loud card! Love it. These little mice are just perfect for this week's cue word! I think I could hear them marching by when I clicked on your blog!! Your marching band is too cute, love their blue jackets to make some noise. While they may be loud, I love a marching band, mice or not, Joyce. This is adorable! Love the mice marching band!